Capture videos from camcorders directly. Convert AVCHD to any format for editing or playing back. Are you still looking for an easy-to-use AVCHD joiner? Some converter would provide .mts or .m2ts output with decoding and encoding. However, the compression progress will take a long time. The fastest way to merge and join AVCHD files into a single file would be the one that does not require recompression. Aunsoft Final Mate provides the express way to join MTS/M2TS sequences with the same format and recording mode. No conversion is needed for the lossless output, and the speed is super fast. 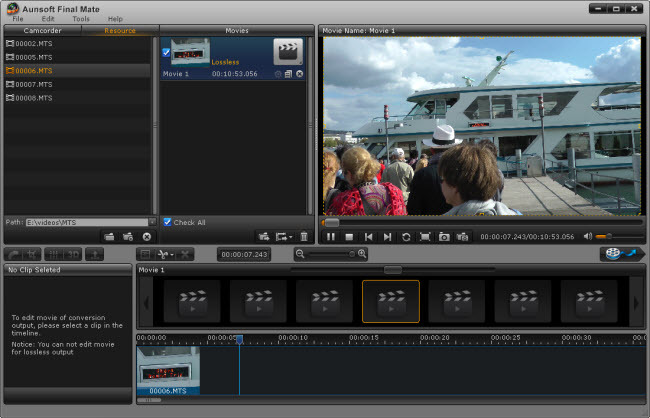 The AVCHD sequences with the same video formats require the video are shot with the same codec, frame rate and size, aspect ratio, sample rate and channels. Actually, if you use the same recording mode on the camcorder like the 1080/60p on Panasonic HDC-TM700, HDC-SD600，HDC-HS700，HDC-TM900 ,the videos will be recognized as a sequence. Below is the quick step-by-step guide for you to merge multiple Panasonic 1080p MTS files from different camcorder to one 1080p MTS output with lossless output. Step 1. Capture MTS videos with Aunsoft Final Mate. Connect camcorder to computer with USB cable, and run Aunsoft Final Mate, you will be asked to follow the wizard. Otherwise, click the Camcorder button to load camcorder videos. You can choose to backup the videos to computer or just import videos. 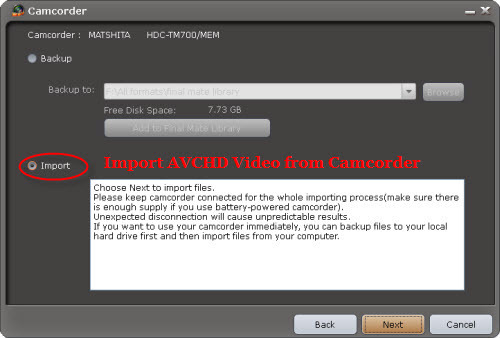 Here we just select Import to add videos from camcorder to the program. After loaded the files to program, you can directly drag and drop one video file or multiple files using standard Shift-Click or Ctrl + A from Camcorder Tab or Resource Tab to Timeline, this way support creating a movie for lossless output, means no conversion. Step 3. Merge MTS with Lossless output. 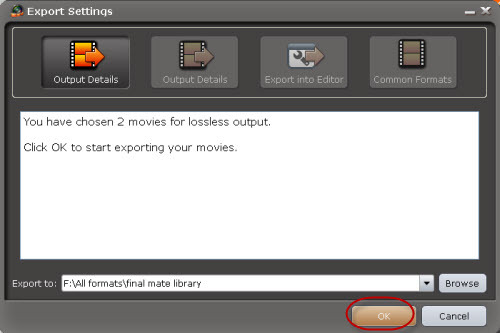 Click the Export button under the preview window, and you will face the window to confirm output details, if it is right, please click the OK button to start merging mts video clips into one mts file as output without re-encoding. Wait for a while, and you will get the videos clips joined into one .mts file for smooth playback with no quality loss. The mts joining process without compression will only take a few minutes. 1. Please note that the mts files with different parameter settings in frame rate or video codec will be not be merged. But you can merge and convert them to suitable formats. 2.The above steps also apply to .m2ts files, .mod files and .tod files for lossless quality output. You can imports videos from camcorders like Panasonic HDC-TM700/HS700/SD700/SD600/TM900, Sony HDR-CX150/CX350/CX550, Sony Cyber-shot DSC-TX7/HX5V, Canon Vixia/Legeria HF S200/S20/S21, Panasonic Lumix DMC-ZS7/TZ10, JVC Everio GZ-HD7/HD30/HD40 and so on. I like your product which did not require the re-encoding of the files, a huge time saver and it also did not destroy the video quality. Very good product is Aunsoft Finalmate. Merge files without recoding to keep quality intact. You should recommend it because people might not find the right merge-product. I am pleased with CUDA and direct import from camcorder, which made me purchase this product in the first place.